There is a very important fact that has been almost completely ignored by the British media. Where did the poisoning take place? Yes, we know, the name of that sleepy town is Salisbury. That’s where Mr. Skripal lives. On March 16, Defense Secretary Gavin Williamson announced that the UK would spend 48 million pounds ($67 million) on a new chemical-warfare defense center. It will be built at Porton Down, a military research laboratory that has manufactured the nerve agents VX and sarin. Where do you think that lab is located? Right, less than eight miles from Mr. Skipal’s home in Salisbury. Vladimir Pasechnik, a senior Soviet expert on biological warfare, who defected to the UK in 1989, worked there. He died in 2001. Russia again? Not a chance. Where he lived was no secret and he had worked there quietly for so many years. It’s the research he did at the Porton Down laboratory that was kept under lock and key. He quit the laboratory in 2000 to set up a business of his own. Since he was no longer working for the government, he was in a position to reveal awkward information. You never know about the people involved in hush-hush activities, and the timing of the events could be a coincidence. But it might not be. The UK officially ceased all activities associated with nerve gas development in 1989 but scandalous stories about Porton Down have been leaked much more recently. The people who worked in the facility were dying under the most suspicious circumstances. In 2010, the Daily Mail published a very interesting report about these mysterious deaths — all related to the development of nerve agents — which was a fact that had been kept under wraps before. Porton Down featured prominently in all those stories. Wouldn’t this be a good time to remember those in connection with Mr. Skripal’s poisoning? And another question pops up. Why is the UK refusing to give Russia the samples of the deadly substance known as Novichok that it says was used to poison the former spy? Isn’t it because the real poison was not Novichok but some other agent developed at Porton Down? Could be. You never know. This guess would at least explain the refusal. Nothing can be said for certain but it’s only natural to look at what we know and make guesses. That’s what analysts are for. Maybe this scenario wasn’t what happened, but there is nothing to rule it out. After all, Mr. Skripal and his daughter got immediate emergency medical assistance. It arrived at once. Intelligence services? Who knows, but the victims were injected with an unknown substance almost immediately. Someone had known in advance that they’d need help. This is an undeniable fact. Another coincidence? Aren’t there too many of them? Anyway, the work to determine exactly what substance poisoned Mr. Skripal and his daughter was done nowhere else but Porton Down. Wasn’t it amazing how quickly they were able to say with absolute certainty that the nerve agent was Russian-produced Novichok? They are unbelievably talented people because normally that takes some time. What next? The UK does not want to go it alone. It has raised the issue in the UN. It has approached NATO. 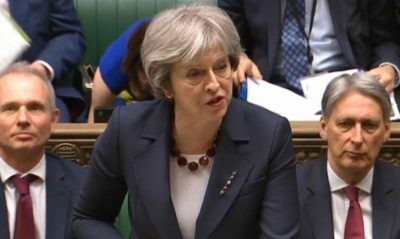 The Skripal case will be added to the agenda at the March 22–23 EU summit and even the talks on Brexit. The Russiagate scandal in the US appears to be dying down. The Skripal case, as well as the furor raised over the events in Eastern Ghouta, Syria, will breathe new life into the ongoing, well-orchestrated attacks on Moscow. These days the divided West faces many challenges. Just look at the divisions threatening NATO and the EU. There is nothing better than an external enemy, even an imaginary one, to keep the West united and led by the US. That’s where Russia comes in. We may never know who is to blame for the attempt on Mr. Skripal’s life — it’s not important for those who are leading the anti-Russia campaign. No opportunity to pour more fuel on the fire of anti-Russia sentiments should be passed up. The British government seems up to the task. Featured image is from NewsLocker.